The ingestion of Ghee is like offering the finest of fuels into the fires of digestion (Agni). In accord with this, Gheebuilds the aura, makes all the organs soft, builds up the internal juices of the body (Rasa) which are destroyed by aging and increases the most refined element of digestion (Shukra or Ojas) the underlying basis of all immunity and the “essence of all bodily tissues”. Maya Tiwari calls Ghee the “single most ojas producing food on earth”. Ghee is known to increase intelligence (Dhi) refine the intellect (Buddhi) and improve the memory (Smrti). Although Ghee kindles or increases the digestive fire (Agni) on which all nutrition depends, it does so without aggravating Pitta – the elemental functioning of fire within the body. In fact, Ghee cools the body, essential in much of today’s world in which everything is overheating. Ghee causes secretions and liquification in the dhatus – bodily tissues – that dissolve wastes allowing the functional intelligences of the body (doshas) to carry away toxins (Ama) (also known as aam). The ingestion of Ghee is used in Panchakarma specifically to first penetrate into and then dissolve ama in the dhatus, allowing the wastes to be then carried to the intestinal tract and then expelled. It is traditionally considered, that the older Ghee is, the better its healing qualities. 100-year-old Ghee is highly valued in India and fetches a very high price. Such Ghee was often kept in Temples in large vats and families often pass on aged Ghee to their next generation to be used as medicine. Ghee is Guru, heavy. It increases the qualities of Kapha and decreases Pittaand Vata, which are both light. In ancient India, wells full of Ghee were especially for those who suffered wounds. When a surgeon cuts open a body, he only does so knowing that the body will be able to heal itself. The surgeon cannot do this. Ghee is known for the quality of Ropana – healing, and its effectiveness in facilitating recovery from wounds. In Ayurveda, when a person has a chronic peptic ulceror gastritis, Ghee is used to heal that ulcer inside the intestinal tract. Ghee works wondrously on bedsores for the elderly or debilitated. It can be applied for broken bones and bruises. It is highly effective for all sorts of skin rashes. It is also used on burns of both fire and chemicals. Once, I accidentally got some sandalwood oil in my eye. It burned intensely and I was unable to wash it out with a variety of eyewashes. I spent hours in pain and finally I remembered to use Ghee. Almost immediately, the Ghee pacified the burning and the eye irritation ceased. Used on the skin, Ghee softens and strengthens, protects and nourishes. Up until the last generation in India, there used to be men who gave Ghee massages on the street. It was always the preferred substance for the skin, but since it was more expensive than oil it has come to be used only for internal purposes. For generations, Indians have used Ghee for cooking and as an added measure on top of their food and as a medicine. In India, medicinal ghee is passed on from one generation to the next. It was used for old and young, for new babies (Mothers in India will massage their children with Ghee) and for those in the last days of their life. I massaged my Father’s body with it before he died – He loved it. Sometimes, when he could not sleep, I rubbed it on his feet and temples and it soothed his agitation. It is considered it one of the best substances for self-massage (Abhyanga). Ghee is used in Purvakarma (early Panchakarma) where a small amount of Ghee is taken first thing in the morning by the practitioner to oleate the internal organs and “dissolve” the ama or toxic wastes in the tissues, allowing them to be carried to the digestive tract for elimination. Ghee is used as a carrier or “yogavahi” for herbs and bhasmas because of its supreme penetrating qualities and thus ability to carry these substances deep into the dhatus or tissues. One or two teaspoons first thing in the morning followed immediately with hot water will promptly produce a bowel movement. It will also warm the body quickly. Two spoonfuls of Ghee in warm (non-homogenized) milk before bedtime is soothing to the nerves and lubricates the intestines and facilitates a bowel movement in the morning. Ghee is excellent for a gargle (gandush) to improve the health of the teeth and gums. Ghee is the most refined end product of milk. (When you make Ghee, you are concentrating the quality of the milk you started with. This includes, antibiotics, hormones (rGBH), chemical pesticides, etc. For this reason, always use the best milk/butter you can find.) When you milk a cow, you get whole milk. If you let this milk sit for a while, cream rises to the top. If you skim off the cream and then churn it, after a while and all of a sudden, the fat globules will begin to stick to each other and form butter. What is left over is buttermilk. In the west today, very little butter is churned the old fashioned way. Most modern dairies, even many “organic” ones, no longer churn their cream to make butter. In a typical dairy in America, the cream is now pushed (extruded) through a fine mesh screen in which the heavier and larger molecules of butter are held on one side of the screen while the smaller molecules of buttermilk pass on through. I recently asked an Ayurvedic Teacher (Vaidya) about what difference this makes. He said that butter made without churning is lacking in a quality of fire (Agni). He even went further in his consideration of difference; the home-based Indian culture churns their cream with a hand churn, rolling it back and forth between their hands. This back and forth action, he said, imparts a particular balancing quality to the Ghee – instead of the one way churning of a gear driven churn. As I have pointed out above, most of the butter made in the West today is not even churned. When we consider the process of butter and Ghee making at this level, we are in the realm of subtlety, but it is in exactly this realm (the subtle) that what is pure and purifying (sattvic) is found. There is one very important difference in the way Ghee was and is made in India. The Indians start out with milk from a cow, just like in the West. But, they do not let the cream rise to the top and skim it off as we do in the West. Instead, and here comes the key difference – they culture the milk with yogurt, allowing it to sit for 4-5 hours, just before it becomes completely soured. Then they churn the whole milk. From that point on, the process is more or less the same. This culturing with yogurt introduces another form of fire (agni) into the substance of refining the milk into butter and then Ghee. As I have said, in my recent visit to modern day India, it was very hard to find high quality and pure cow Ghee. The commercial milk, cream and butter there are now homogenized and pasteurized or now ultra-pasteurized (This is a process whereby milk is heated to a higher temperature than pasteurization for a shorter period of time. This kills and destroys various living substances/enzymes in the milk thus prolonging shelf life. Ultra pasteurized milk can keep un-refrigerated for over a month). According to Ayurvedic Vaidyas I have consulted with, all of these factors increase the Vata (air and ether/destructive, catabolic, drying, rough) qualities in what was originally a very Kapha (earth and water, building, oily, tonifying, anabolic) substance – milk. Some of these processes, like homogenization, make the milk, and thus the cream and butter, indigestible. One of the things you can look for in milk and cream is the sticky quality (picchila), one of the gunas of Kapha. It will be lacking in processed milk products. Now, back to making Ghee. Once you have obtained your butter, you heat it in a stainless steel or enamel pot, bringing it to a boil. I believe that it is best to make your Ghee in stainless steel heavy pots, rather than aluminum because of the toxicity. It is best even to avoid thin stainless steel. This is because a heavier pot will distribute the heat of the fire more evenly, surrounding the Ghee. Always try to use real fire rather than an electric range (This is again in the realm of subtlety and sattva that I referred to earlier). There is a quality of Agni that lends itself and pervades a substance cooked on flame that is not there when cooked on electricity. Because I could not understand the difference between the “heat” of a fire and the “heat” of an electric range, I asked several Vaidyas about this in India. They all simply said that fire was a superior (more sattvic) way to cook food. While I personally still cannot explain that to anyone, that is the way I do it. It is very clear to me that it is most important to create and enjoy a beautiful and positive environment when you are making Ghee. This subtle recommendation is perfectly in line with cooking Ghee on an open fire – “it makes a difference”. Once the Ghee begins to boil, turn it down to the lowest flame at which it will continue to boil. As it boils, moisture evaporates off it and it will begin to “clarify” – the butter will turn from cloudy yellowish liquid to a more golden color. Whitish cloudy milk solids will rise to the top and sink to the bottom. Do not stir it. After an hour and half to several hours, depending on the amount and the size of the pot and the amount of Ghee compared to the flame, your Ghee will be ready. The moment Ghee is “ready” is very critical. If you cook the Ghee too little, you will be left with moisture in the Ghee and it will lack the exquisite taste and qualities that it can develop, also, it will tend to spoil or sour. If you cook it too much, it will burn and impart a certain nutty flavor to the Ghee. This does not ruin the Ghee at all, but it is to be noticed, so that over time you can capture the “perfect” Ghee to be experienced between these two “extremes”. After the Ghee is done, you skim off the top light crust of whitish milk solids. These and the heavier ones at the bottom of the pot are traditionally used to make sweets. Children in India love them and always plead with their Mothers to have the leftovers when Ghee is made. Then, you pour the golden, sweet-smelling liquid through layered cheesecloth – to catch any last impurities into a bottle, leaving the slightly burned milk solids (caramelized lactose) on the bottom of the pot you cooked it in (Ghee has no lactose or milk sugars in it). Be sure to not close the glass jar into which you pour the hot Ghee until it comes to room temperature. The reason for this is that there should not be any moisture from condensation that may form on the inside of the jar. 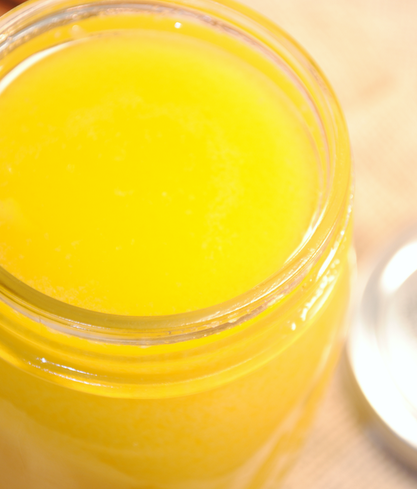 It is moisture that spoils Ghee, allowing a mold to grow and causing it to go bad. This is the reason that you always use a clean and dry spoon to take your Ghee out of its container. It is also a reason not to refrigerate your Ghee. One, because it is not necessary and two, it causes condensation to form inside the jar as you take it in and out of the refrigerator. It is best to make Ghee on the waxing fortnights of the moon as the moon represents the Mother and nurturing and all the best qualities of milk and butter are energized at this time. Regarding time and season, the quality of Ghee will change as the time of year and the diet of the cows change. Not all milk cows in the West are given green pastures to graze on. Even those, which are allowed to graze in the fields, often do not do so all year round. In winter, there are many days that the cows are not able to go out in the pastures and there is more hay and silage in their diet. This will change the quality of the milk, butter and Ghee. I have noticed that the more the cows graze in the fields on grass, the more yellow is the Ghee. This “yellow” is the result of more chlorophyll in the butter. The making of Ghee is a very beautiful and peaceful experience. The sound of softly boiling butter, the pouring of the thick golden liquid into bottles … this wonderful smell permeates the space. In India, Ghee is made from both Cow and Buffalo milk. If we consider the qualities of both of these animals, we can see why the Ghee of Cows is to be preferred. If we look at the bodies of a Buffalo and a cow, the buffalo is more heavily muscled; it is a denser animal in its makeup. Cows have a more moderate make-up of fat. The Ghee of a Cow is in liquid form at body temperature. The Ghee of a Buffalo is still slightly solid. Buffalo will eat almost any food, even spoiled food, while Cows in their natural environment, will turn away from such fare. Buffalos are often quite dirty and smell more strongly than Cows. Cows tend to be clean and like little dirt on their bodies. Cows smell quite good as I have experienced, when I stopped to pet and smell them on the streets of India where they roam about, ubiquitously, slowly and peacefully. Finally there is the striking difference in temperament between a Cow and Buffalo. Cows are far gentler in nature. Buffalos are comparatively more stubborn and aggressive. Because of these qualities and more, Buffalo milk and Ghee are considered more dulling (tamasic) while Cow milk and Ghee are considered more pure and purifying (sattvic). When I asked my Indian acquaintances why there is a growing use of Buffalo milk and ghee over Cow milk and Ghee, they all said, “It is because the Buffalo give more milk”. Furthermore, the Indian peasants seek the nourishment of Buffalo Ghee, which has a far higher fat content than cow Ghee. Even in Vrndavan, the home of Sri Krishna, where he himself was a cowherd, protector of the cows (Govinda) and the divine lover of the Gopis, cowherdesses, I was usually unable to find anything but Buffalo Ghee in the marketplace. You can tell the difference because Buffalo Ghee is white and Cow ghee is yellow. Cow Ghee is used in lamps in temples and pujas all over India. It is said that the light of a Ghee lamp is more beautiful and brilliant than any other light. The light of burning Ghee is said to ward off negativity and evil influence.